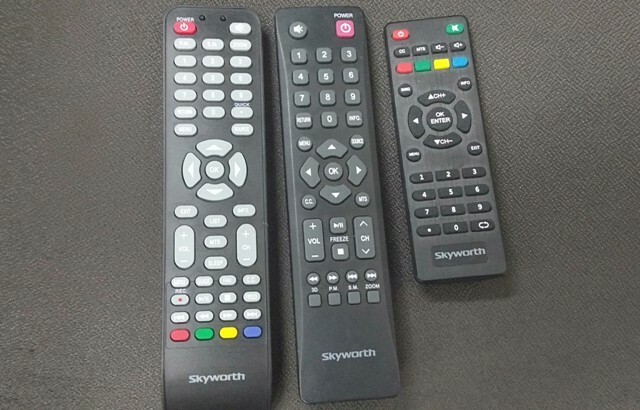 Skyworth remote control have divided into three(3) major category. The Skyworth basic remote, the smart remote, and the android remote. And again both Android and Smart remote comes into several design. We have the Skyworth Android remote for Netflix and None Netflix LED TV. 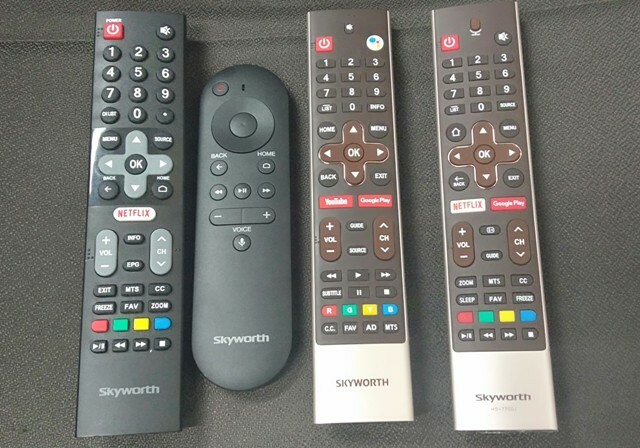 Likewise, the Skyworth Smart remote also comes with Netflix and None Netflix too. 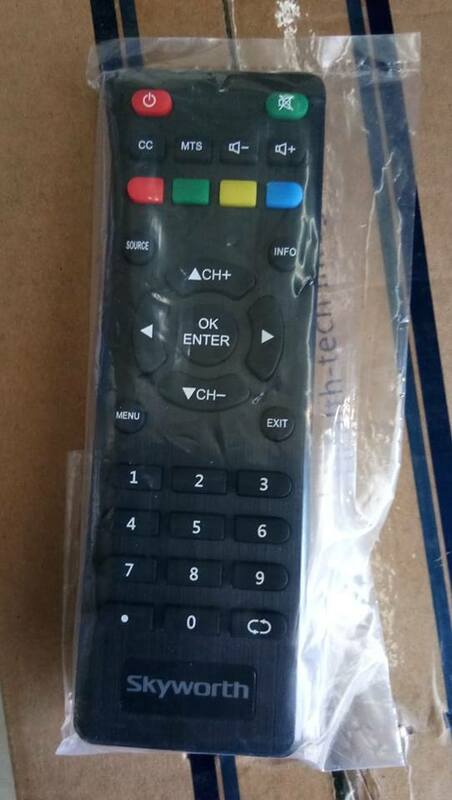 This type of Skyworth remote, comes with the basic function only and with the following button. Power on, power off, mute, numeric key for channel selection (1,2,3,4,5,6,7,8,9,0), RETURN, INFO, MENU, SOURCE, arrow up, arrow down, arrow left, arrow right, OK, C.C., MTS, Volume +, Volume -, Play, Pause, Stop, Channel up, Channel down, Backward, Fast forward, Previuos, Next, 3D, P.M., S.M., Zoom in and Zoom out. Please refer to the actual photo of basic remote above. The Skyworth basic remote is always come partnered with the Skyworth Basic LED TV regardless what size it is (14 inches to 65 inches). 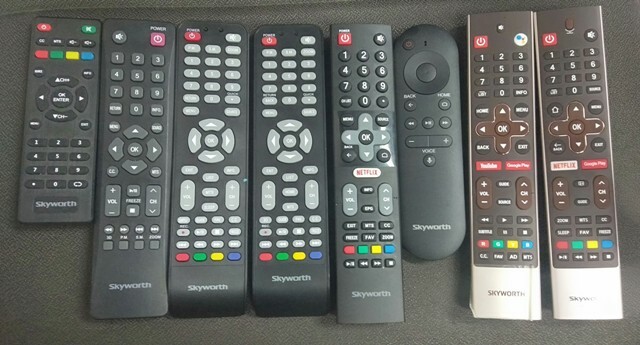 But unlike from the other brand, Skyworth Basic remote has a backward compatibility to older version of Skyworth LED TV, even with the Skyworth 2017, 2014, 2012, 2010 and older models. Furthermore, Skyworth Basic remote control also work with both Smart and Android in limited features. This type of Skyworth remote, comes with the Smart function “HOME” and yet carrying the following basic button as follows. Power on, power off, mute, numeric key for channel selection (1,2,3,4,5,6,7,8,9,0), RETURN, INFO, MENU, SOURCE, arrow up, arrow down, arrow left, arrow right, OK, C.C., MTS, Volume +, Volume -, Play, Pause, Stop, Channel up, Channel down, Backward, Fast forward, Previuos, Next, 3D, P.M., S.M., Zoom in and Zoom out. Please refer to the actual photo of basic remote above. The Skyworth smart remote is always come partnered with the Skyworth Smart LED TV regardless what size it is (32 inches to 65 inches). Skyworth Smart remote comes also with a backward compatibility to older version of Skyworth Smart Digital LED TV, even with the Skyworth models 2017, 2014, 2012, 2010 and older. 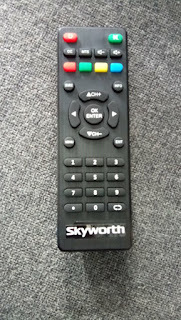 Furthermore, Skyworth Smart remote control works 100% well in both Basic and Android Skyworth TV regardless the model. Meaning, Skyworth Smart remote control is compatible to Skyworth Basic LED TV, Smart LED TV, Digital LED TV, Smart Digital LED TV, Smart AOSP LED TV, Basic Netflix LED TV, Smart Netflix TV, and To all Android LED TV regardless the version (Android version 4.4.4, Android version 6, Android version 7 and the latest Android version 8.0). 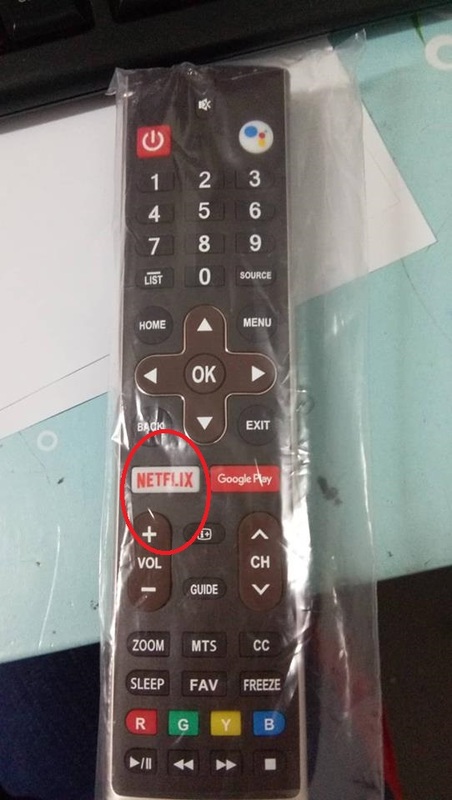 This type of Skyworth remote, comes with the Android function “Netflix”, “Youtube”, “Google Play”, “Voice Assisstant” and yet carrying the following basic button and Smart function as follows. HOME, Power on, power off, mute, numeric key for channel selection (1,2,3,4,5,6,7,8,9,0), RETURN, INFO, MENU, SOURCE, arrow up, arrow down, arrow left, arrow right, OK, C.C., MTS, Volume +, Volume -, Play, Pause, Stop, Channel up, Channel down, Backward, Fast forward, Previuos, Next, 3D, P.M., S.M., Zoom in and Zoom out. Please refer to the actual photo of basic remote above. The Skyworth Android remote is always come partnered with the Skyworth Android LED TV regardless what size and model it is (32 inches to 65 inches). Skyworth Android remote comes with a backward compatibility to older version of Skyworth Android LED TV, even with the Skyworth models 2017, 2014 and older. Furthermore, Skyworth Android remote control works 100% well in both Basic and Smart Skyworth TV regardless the model and size. Meaning, Skyworth Android remote control is compatible to any Skyworth Basic LED TV, Smart LED TV, Digital LED TV, Smart Digital LED TV, Smart AOSP LED TV, Basic Netflix LED TV, Smart Netflix TV, and To all Android LED TV regardless the version (Android version 4.4.4, Android version 6, Android version 7 and the latest Android version 8.0). The Skyworth Digital TV regardless it is an Android Digital TV or Smart Digital TV or Basic Digital TV, it shares the same remote based on there category. Inside the package or the box it comes with either one of the following, Basic, Smart or an Android remote control. 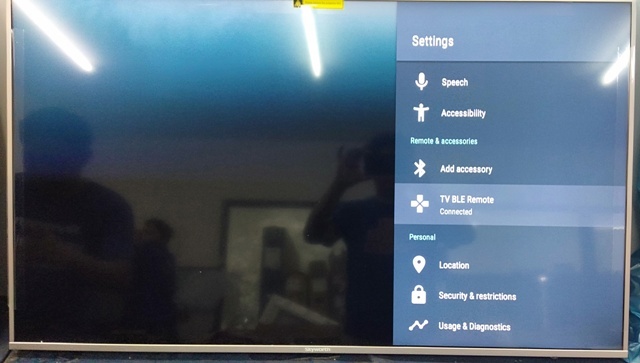 From 2018 up to present, Skyworth Philippines have introduced a bluetooth capable TV in the Philippine market. It is either Smart Digital and Android TV. 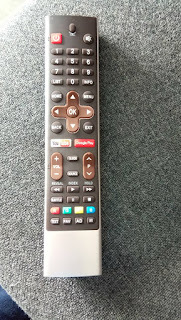 On there later model Bluetooth comes separate but with their newer model it comes featuring on the main remote control. Bluetooth remote main function is to access AI TV features such as Voice command, gesture and other features that is related to Google AI assistant and Amazon AI Alexa assisstant. Voice remote is also known to others as the Bluetooth remote. Since they are similar, therefore they share the same function as a tool to access AI TV features such as Voice command, gesture and other features that is related to Google AI assistant and Amazon AI Alexa assisstant. Pairing TV and remote is not tricky to do as other may think. However, not all Skyworth TV share the same pairing procedure. For example the Skyworth Android 55G6 is not the same on how we pair the Skyworth Android 55G2. The how to pair remote to TV is available on TV manual. However, in the event of lost most of Skyworth TV comes with E-manual which is made available on TV home page. How to connect Bluetooth / Voice Remote to 50G2, 50G2A, 55G2 and 55G2A LED Android TV? Step by step guide on how to connect or pair the remote to 49G2 and 55G2. On your remote, press “HOME”. Using arrow down or arrow up button, locate “Settings” and press “OK”. On Settings menu using arrow down or arrow up button, locate “Add accessory” and press “OK”. The screen will greet you with the following statement “Searching for accessories Note** Before pairing your Bluetooth devices, make sure they’re in pairing mode“. On your remote press the pairing key “HOME and Arrow Left Button” to activate the “pairing mode”. Please refer to the figure below. On your TV Screen “TV BLE Remote | 00:81:F9:00:73:A5” came out. Please refer to figure below. On your TV below TV BLE Remote “Paring…” then “Connecting” wait for it. Enjoy messing around with Skyworth Voice Assistant AI remote! How to Connect Skyworth E6 Series, E6D Series, E3 Series and E3D Series Remote to Android TV? E6 Series models includes (32E6, 40E6, 43E6, and 49E6), E6D Series models includes (32E6D, 40E6D, 43E6D, and 49E6D), E3 Series models includes (32E3, 40E3, 43E3, and 49E3), and E3D Series models includes (32E3D, 40E3D, 43E3D, and 49E3D). For visual and complete illustration, please refer to above guide. It share the same photo. Skyworth E6 Series, E6D Series, E3 Series and E3D Series Voice / Bluetooth Remote. Please see figure below for your reference. How to Connect Skyworth G6 Series (49G6, 55G6, and 58G6) Remote to Android TV? Connecting G6 Series Bluetooth / Voice Remote is different from above. However, they’re share the same TV display illustration. On your main remote control (the first one from the top), press “HOME”. On your remote press the pairing key “OK and Arrow Left Button” to activate the “pairing mode”. Please refer to the figure below. How to unpaired Bluetooth / Voice Remote? Select “Unpair” and press “OK”. About the question if the Skyworth TV will works with the universal remote control? The answer yes it works, however with limited function only. Based on the customer feedback, universal remote control will only work on Skyworth TV as follows; Power on, Power Off, Channel selection, Volume up and Volume down. 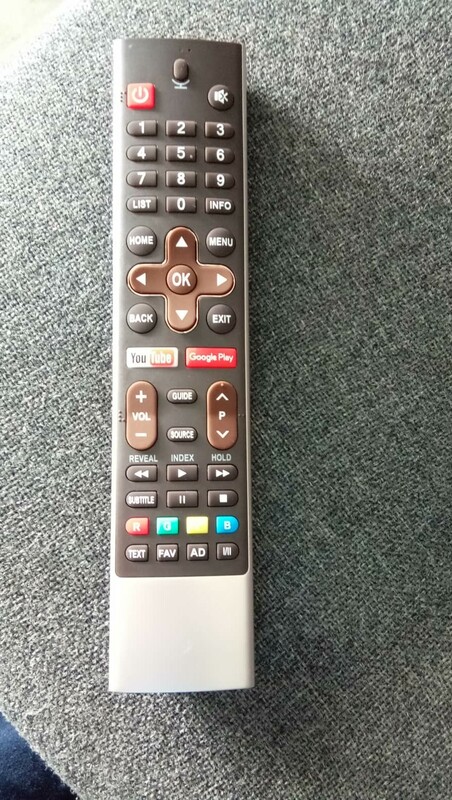 Furthermore, unlike the original Skyworth remote, universal remote control need to get paired to the TV first using pairing code that is available on it’s label. Moreover, there are times that the pairing code is not working. Means, the money you have pay for the universal remote control is not worthit. Therefore, buying or using universal remote control with Skyworth TV is not recommended if you like to maximized the TV function. There are few option available from Google play store to be install as Skyworth remote control app. However, they are not work with the most Smartphone. The basic requirement, the phone must have featuring or support the IR Blaster, else the remote will not work. Furthermore, only basic function will work using the app such as, Power on, Power Off, Channel selection, Volume up and Volume down. The app is function is truly limited as Universal remote control has. Universal Remote Application is an App that is created for all LED TV. However, since it is an App basic requirement, the phone must have featuring or support the IR Blaster, else the remote will not work. As of the moment here are few option available from Google play store to be install as universal remote control app. Remote is a necessity for a TV owner especially those who have own a TV set that comes with no manual button. Without the remote, it is worth less. Truly this is very frustrating. What the the cause why my Skyworth remote doesn’t work or stop working? To answer that question I prepare some DIY troubleshooting guide before you call a service technician or buying a new remote. The first and the very basic is check the remote batteries if it is properly installed. If does and still not working, try to change it with the new one. If it doesn’t work then call a technician for the repair. What are the cause why my remote stop working? Common cause why the remote stops working are the following, water spill, drop in regular basis, and power surge. Wondering how a power will affect the remote since it only using two 1.5 volts AAA batteries. It is not the battery, it is your static current who is affecting the remote. How much the remote repair cost. Usually technician minimum labor charge is 500 pesos here in the Philippines plus the component which they will charge you from 350 pesos to 500 pesos with a one month warranty. Therefore, the total cost of remote repair minimum 850 pesos. While buying a new remote will cost you 1000 pesos plus a delivery fee of around 200 to 315, total 1200, 1315 respectively. Therefore, buying a new remote is highly recommended than go for repair. Where to buy Skyworth Remote? 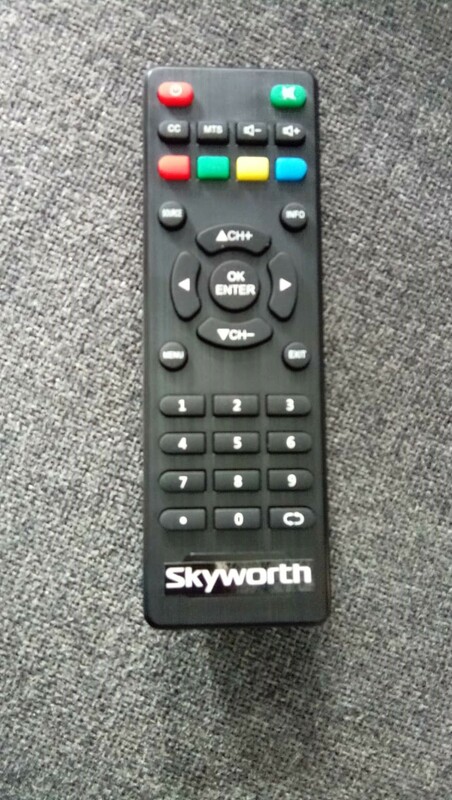 Since, 2009 Skyworth Philippines didn’t sold it’s remote control to any physical. It only available to buy directly from Skyworth Philippines main office through it’s assigned and authorized staff. Here is the number of assigned and authorized staff to sell Skyworth Remote online, 09672770301. Take note, they only able to assist you through text since this number is connected to E1 system. But unlike other online purchases who offered COD (Cash on Delivery) or COP (Cash on Pickup), Skyworth finance department has come with an odd policy, “Payment First Policy”. It means that you need to pay for the remote first before there warehouse to expedite the item. Payment method for Skyworth remote comes with tons of option. They can able to collect on 7-Eleven seven connect which is very recommended, Cebauna, Palawan, Western Union, M Lhuillier, G-Cash, Bayad Center and Bank Deposit. Bank deposit is not recommended because most of the time it goes offline and the deposit transaction fee is to high for it’s price. Furthermore, the confirmation is manually made (takes couple of days or even weeks) and there is no way to track your made payment other than deposit slip. Since the 2009, Skyworth Philippines sold it’s remote 1000 pesos each plus a delivery fee 200, 315, NCR, Provincial respectively. However, there are times that they’re not charging delivery or sell Class B remote at lower price ranging 700 to 900. Class B remote comes with visible scrathche to hairline scratches. But one thing for sure, Class remote is also know as the second hand remote control or repaired remote. Skyworth remote comes with no warranty as clearly stated on there warranty terms and condition. Written as; 3. Accessories (e.g. remote control, wall bracket, USB, and freebies) are not included in the service warranty. All Skyworth remote works across all Skyworth model. Voice / Bluetooth remote is 100% compatible to one another.